You want the best of all when you are the Bride, after all its your day and you want to look perfect. 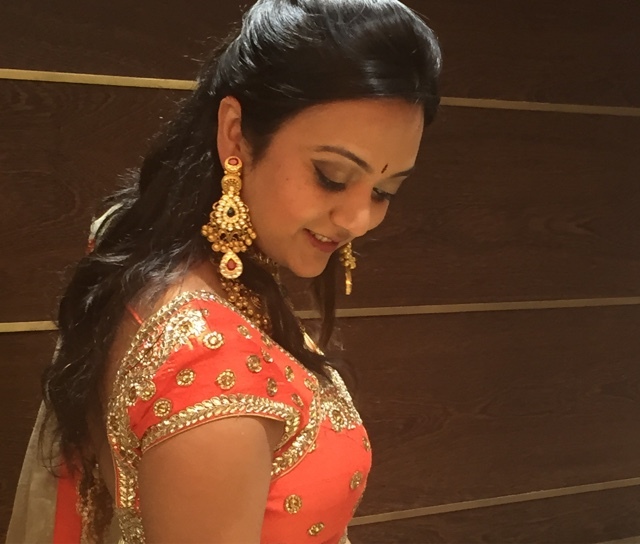 In Indian weddings, the most important element in a bride's look is the jewelry. I remember i spent months planning about my bridal gold jewelry during wedding and i think most of us do. If you have been there and done that you know how stressful it can get. Especially when it is really expensive and its not often that you spend a fortune on your jewelry. The bridal gold jewelry you buy for your wedding are signature pieces which stay with you forever. You cherish them throughout your lifetime. Jewelry is an extension of ones's personality, i feel. And for me whatever I wear should really suit my personality. When I was flying to India, I had a layover in Dubai for few hours and I was so excited to dedicate this time entirely for gold shopping. But after hours of scanning through different designs I couldn't find one piece which I wanted to take home with me. I was so disappointed. 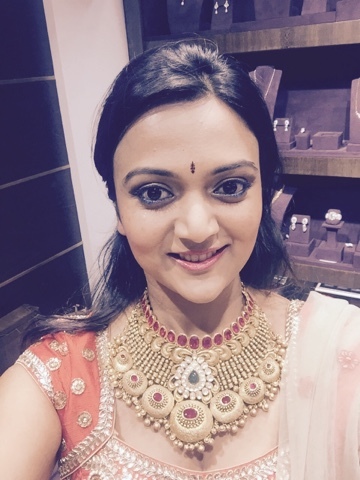 While I was in India I had the privilege of collaborating with the prestigious Manubhai Jewelers, Mumbai. I didn't realize until I saw many beautiful women outside their store applying henna on their hands, that it was Karwachauth that day. What a perfect day for a bridal shoot. The staff was friendly and courteous. The store is really spacious given that its in the city. They have wide range of collection and something for every occasion. While I keep mentioning about gold jewelry all the time. Don't be mistaken, Manubhai Jewelers do have exclusive range of diamond jewelry as well. Right from traditional diamond style to Italian light weight and also modern and latest princess cut diamond rings, necklaces and earrings. While i was impressed with their collection and the way they were organized, i wanted to check out the traditional gold jewelry like Tulsi Haar, Chaplar, Choker, Mangal Sutra. They had all of them in all possible styles. I did ask for few very particular style of traditional jewelry and they knew exactly where they were. Sometimes you fall short of words to describe a place and today am short of words to describe their range so all I can suggest is next time you are in Mumbai, make sure you to stop at Manubhais and I assure you, you wont regret it. 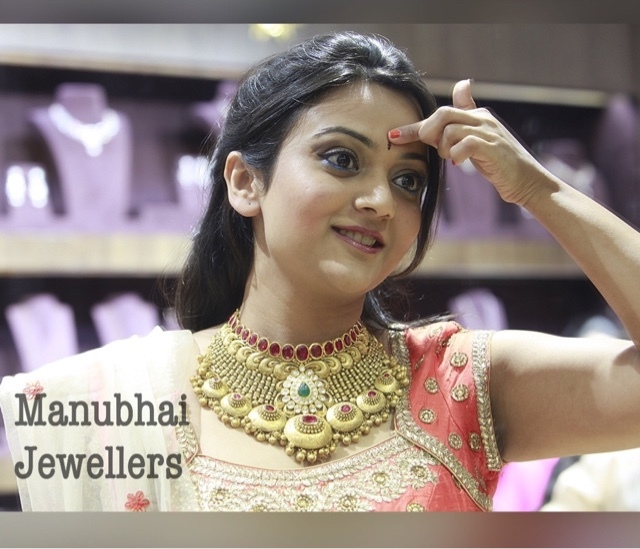 You could also check their amazing collection on their website here Manubhai Jewelers. For now, let me leave you with the details of the custom made bridal set that i am wearing in these pictures. Bridal Choker: 22K gold with white parabs with semi precious stones in a kundan setting and intricate carvings complete with south sea pearl. The whole set as well as the earrings are complete with little dainty ghungroos that chime elegantly with every step. Now coming to my outfit, this is a heavy sequenced bridal designer lehenga from Anisha Shetty. I have been married for 2 years now but that day I felt like a Bride again. More about the outfit details in the next post. To see the complete outfit and more pictures, check out this post Anisha Shetty - Celebrity Designer. You look stunning! Happy new year, Ananya. Wishing you a great year ahead. Congrats for your association with Manubhai Jewellers. Much more to achieve...You're always very professional. Great going Ananya! Need to check out their jewelry! Wow Ananya.. love your outfit & the jewelry is too beautiful..
U look straight out of a dream...love the dress. Stunning pics dear! Have a rocking 2016! Really awesome post. I really loves the collection of best designer jewellery. wonderful woman!!! I love the makeup and dress !